I guess it all started when James posted a picture of his desk back in 2003. Anthony joined in with a desk from 2005, and it was all downhill from there. 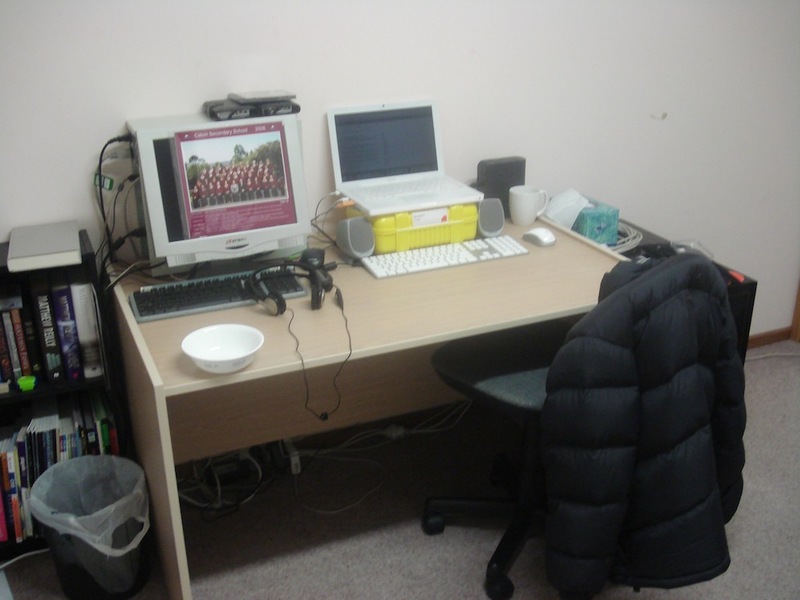 As far as I can tell, the oldest photo that I can find of my desk is from July 2008. I can remember having a desk that goes back even further than that, but that sounds about right: around 2008 was when I got my first computer, the first computer that was well and truly “mine”, as opposed to the computer I had previously shared with other members of the family. If I cared, I could probably look through a few archived hard drives that contain backups of previous computers to see if a picture earlier than 2008 existed, maybe from an old camera-phone, or maybe even an older camera. Come to think of it, we had an old digital camera from around that time, but I’d be damned if I knew where to look to find photos from it. In an increasingly digital world, everything becomes easier. More accessible. Everything and everyone is interconnected thanks to the world wide web, and in terms of photography, that means anyone can pick it up and press shutter buttons to produce photos. But here’s the thing: digital is cheap. Digital photography has evolved into us taking better photos, for sure, but it has also meant we’re constantly taking photos. You’ve seen it yourself: people Instagram-ing their lunch, people taking pictures of their cat, their dog, a new vase of flowers, their new outfit, a messy room, their unmade bed, a new toy, the list goes on and on. As much as we’re taking better photos, some of that can be attributed to the fact we’re taking a lot more photos than we used to — our keeper rates might not have gone up, but because we’re taking so many photos, it doesn’t really matter anyway. Digital (photography or otherwise) has created this culture where it’s as if there’s this unsaid message, one that says “if you don’t capture the memories now, then they’ll be gone forever”. It’s not uncommon to hear people saying things like “if we screw this one up, we can just delete it and re-do”. Or “take a few photos, so at least one will turn out okay”. I mean, high-FPS burst mode on digital cameras was practically invented so you could fire away bursts during group shots, so you can be 100% sure at least one of the shots will feature everyone with their eyes open — when was the last time you heard a photographer saying “now, everyone close your eyes and open them on the count of three”, at which point he’d click the shutter? Never, right? Which brings us back to this idea that taking more photos can often lead to better photos, and the reason we take better photos is because digital is cheap. I’ve felt this pressure myself, too. I’ve often found myself saying: “hey, this costs you nothing and means you can remember every detail of this moment every time you look at this photo in the future” on more than one occasion, and you know what? There’s nothing wrong with that. As humans our memories aren’t perfect, so if we need a little help remembering our kids’ first steps, or that time when bird poo landed spontaneously on our friend, or that time we saw our friend at that place, what’s the harm in taking a photo to remember the occasion? Digital is cheap. But it doesn’t matter, because memories aren’t. So, you wanna be a photographer?